Based on years of hands-on experience and building on the breakthrough ideas of Boards at Work, Charan provides practical, actionable ideas to move boards to a higher level of performance—to make a step-change improvement in the quality of their governance. By detailing the evolution of board dynamics in the post–Sarbanes-Oxley environment and providing insight into new best practices, Ram Charan has developed a comprehensive guide to creating and maintaining a next-generation board. In this updated third edition, Carver continues to debunk the entrenched beliefs and habits that hobble boards and to replace them with his innovative approach to effective governance. This proven model offers an empowering and fundamental redesign of the board role and emphasizes values, vision, empowerment of both the board and staff, and strategic ability to lead leaders. Policy Governance gives board members and staff a new approach to board job design, board-staff relationships, the role of the chief executive, performance monitoring, and virtually every aspect of the board-management relationship. This latest edition has been expanded to include explanatory diagrams that have been used by thousands of Carver’s seminar participants. It also contains illustrative examples of Policy Governance model policies that have been created by real-world organizations. 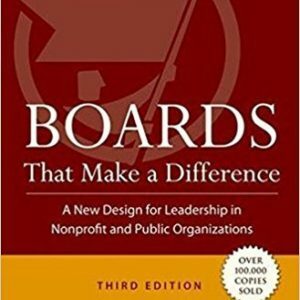 In addition, this third edition of Boards That Make a Difference includes a new chapter on model criticisms and the challenges of governance research. “We’re nearing the end of an era. The age of the imperial CEO and the ornamental board of directors is waning, but what comes next isn’t clear. Every board of directors is approaching a fork in the road, forging new working relationships at the top of the corporation. The path each company takes will have huge implications for its shareholders, employees, and corporate leaders. Building Better Boards is a practical and provocative blueprint for helping CEOs and boards create real value by striking the right balance between wp-contention and collaboration. 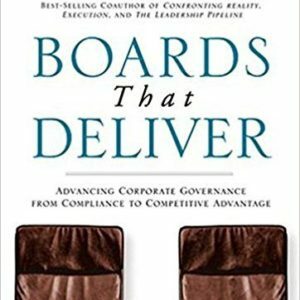 It’s an approach to corporate governance that goes far beyond minimum compliance with legal requirements; this is about enabling the board, for the first time, to perform as a team in a way that significantly improves the quality of management’s decisions without interfering with management’s prerogatives. “We are at a crucial juncture in the evolution of business and the economy. We must now reshape the structures and practices of business leadership to avoid going down the same path again. To a large extent this is a question of governance and the role of corporate boards, to help us wrestle with critical issues like CEO performance and succession, compensation, and forward-looking strategy. 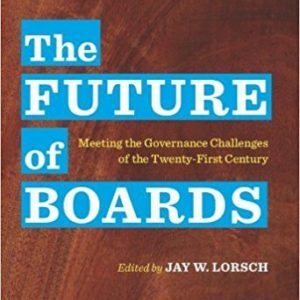 In The Future of Boards, governance sage Jay Lorsch has gathered thought leaders and some of the most experienced voices at Harvard Business School to describe the moment we are in, identify and analyze the salient issues, and chart a course for the future. Articles include Bill George on how boardroom conflicts can be understood and managed; Krishna Palepu on how directors can gain the knowledge necessary to effectively oversee strategy; Lorsch himself and colleague Rakesh Khurana on how boards can set reasonable compensation while still motivating top talent; and Ken Merchant and Kat Pick on group pathologies in the boardroom and how to overcome them. 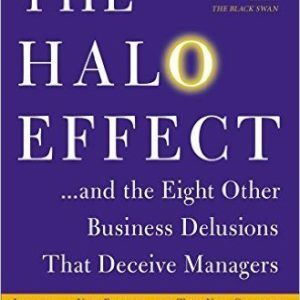 Phil Rosenzweig unmasks the delusions – errors of logic and flawed judgments that distort our understanding of the real reasons for a company’s performance – that are commonly found in the corporate world. These delusions affect the business press and academic research, as well as many bestselling books that promise to reveal the secrets of success or the path to greatness. Such books claim to be based on rigorous thinking, but operate mainly at the level of storytelling. They provide comfort and inspiration, but deceive managers about the true nature of business success. In the last thirty years, there has been a gradual erosion in the abilities and responsibilities of corporate boards. In addition to the ethics scandals that have plagued companies both new and established over the last three years, a number of over-diversified, over-staffed companies experienced failures that might have been avoided had there been proper oversight on the part of the board. While reform of the governance system has received considerable attention from the press, business leaders, and politicians, there have been few analyses of what is really happening on a systemic level, and even fewer workable suggestions for reform. 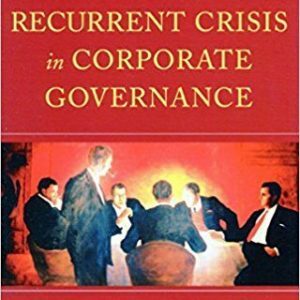 The Recurrent Crisis in Corporate Governance provides an expert assessment of what went wrong on corporate boards and how to fix them. 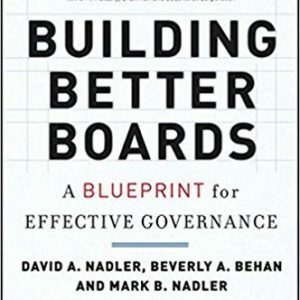 The book begins with both a legal and economic examination of corporate governance during the last three decades, including the broad issue of boards taking on responsibilities without being able to fulfill their obligations because of the lack of access to information and people within the corporation. The authors then go on to show the correlation between strong board performance and strong company performance, make the case for separating the CEO and Chair positions, comment on the collapse of nine major corporations, including Global Crossing, K-Mart, Lucent, and Qwest, and provide suggestions on how boards can be more effective stewards of the shareholders’ and public’s trust.